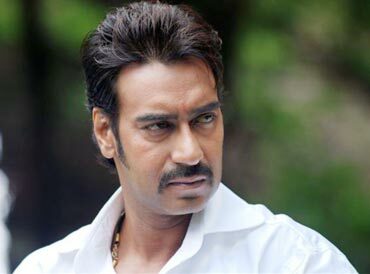 With a big hit Raajneeti behind him, Ajay Devgn is ready with yet another thrilling drama, Once Upon a Time In Mumbaai. Releasing this Friday, the film will see him play Haji Mastan. Devgn seems confident about another hit this time too. The actor spoke to Trans World Features correspondent Gaurav Sharma on his films, and becoming a father once again. You must be on a high after the huge success of Raajneeti. It is really a great feeling. Given the canvas of the film, we were a little weary but Prakashji (Prakash Jha) pulled it off with elan. All credit needs to be passed onto him. Download Once Upon a Time in Mumbai wallpapers, ringtones & more! Raajneeti has once again proved that you are Prakash Jha's lucky mascot. Somewhere deep down, we all believe in luck. But all I can say, it is 99 per cent perspiration that reaps the results. Of course, we are really happy as a team because whenever he has come up with a role for me, I have felt confident. In your new film, Once Upon A Time In Mumbaai, you are back to playing an underworld don. I'm really excited about the release. It's my second innings where I play a don after Company. And this is one role that anyone would have loved to play. I am lucky to have got the chance. It has a very intricate story with high voltage dialogues and I really had a great time mouthing them. Which was more interesting: Company or Once Upon A Time In Mumbaai? To be honest, both are very different even though both revolve around the underworld in Mumbai. Just like I got appreciated playing Malik in Ram Gopal Varma's Company, I am expecting the audience to appreciate my role here as well. My character Sultan here has a good side. He is generous, warm and accommodating. This is completely different from the one I have played earlier, where the gangster is shrewd and conniving. Emraan Hashmi plays Dawood Ibrahim in this film, someone you had played in Company. The roles are modeled on the same man but then again, they are completely different. Emraan's character Shoaib is director Milan Luthria's imagination where as Malik was Ramu's imagination and they both have to be different. Did you give Emaraan any tips? Tips or course correction is inherent to filmmaking. Not just me or another actor, anybody in the directorial team can come up with a value addition too. All I can say is I got along very well with Emmy and there was perfect harmony. Your role in Once Upon A Time in Mumbaai is apparently based on the life of Haji Mastan. The title itself speaks a lot about the film. It's about the time when Mumbai started falling under the mafia siege. The culture, fashion and lifestyle in Mumbai changed a lot during that period and we have tried to explore all these areas and portray them in the film. There were a lot of things like sideburns; bellbottoms and typical songs that we used to listen to at that time. They are still in vogue today. They have only reinvented themselves. The audience has high expectations when you are playing a real life character. Earlier, you played Bhagat Singh as well. [Smiles] Yes, people draw parallels. But beyond a point, it is fiction. Like any other film, I have blocked time to think about the character. I have devoted time to understand the character of Sultan and his vision. A little bit of background study was a must. As for playing real life characters, it's definitely a challenge as people have a preconceived notion of the character. I think the primary requirement of any such plot is a very tight script. The rest is on the actor as to how much he can absorb and emote. Bhagat Singh was an exact portrayal of the legendary freedom fighter but Sultan still remains fiction. On the personal front, you are preparing for fatherhood once again. At the same time, you have signed on quite a few projects. [Laughs] That is an interesting observation. But I have been juggling between multiple projects and my family life all throughout my career. I live in a joint family with my parents, Kajol and Nysa, so there is a support system in place. Apart from that, I make it a point to spend as much time as possible at home when I'm not working and play with Nysa. So I think I'm well prepared to take on the responsibility of fatherhood. Vote! Who plays the blind girl best?